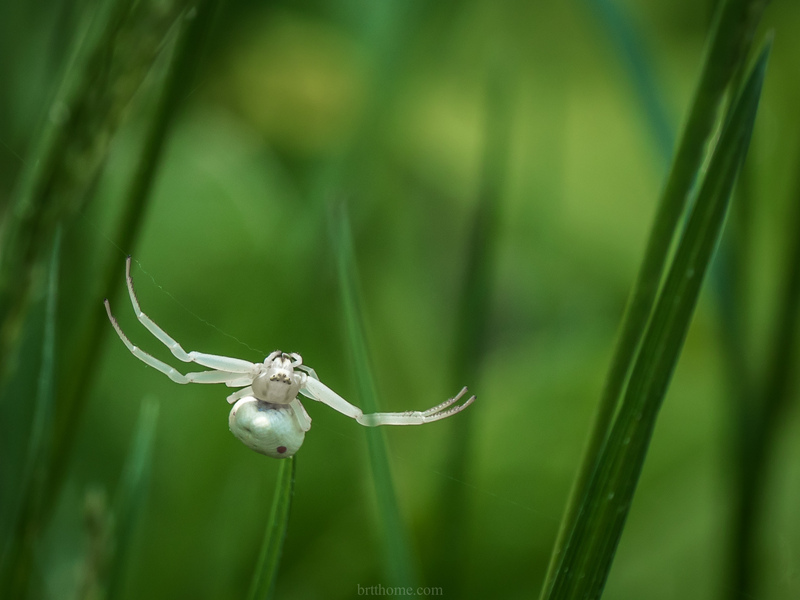 In the early afternoon I noticed a white “blob” swaying in the wind on a blade of grass. 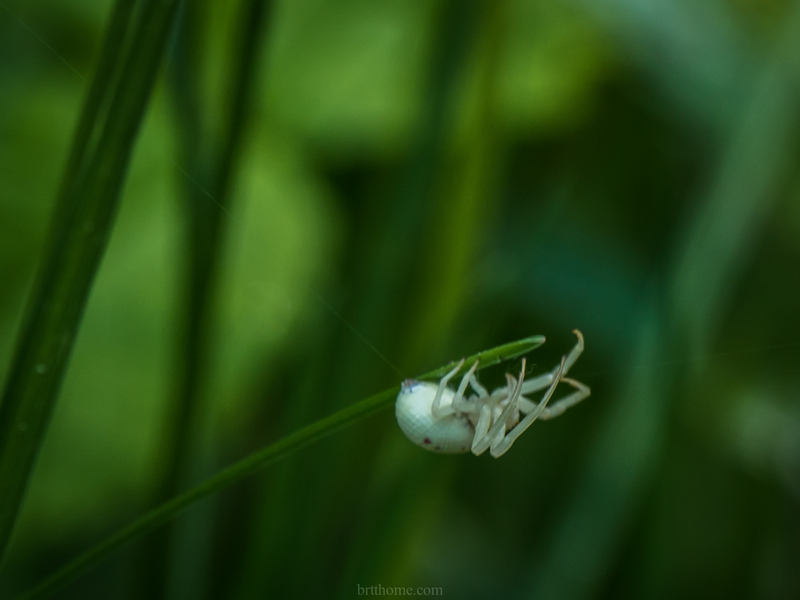 Upon closer inspection with the telephoto lens it appeared to be a flower (crab) spider, Misumena vatia. Over the next 45 minutes I watched that spider travel about 3 metres downwind into a bunch of emerging Canada Anemones. Most of the time I was looking through the Electronic View Finder of the camera, trying to follow and keep focus on that little piece of white bobbing in the strong gusty wind. I managed to get a few pictures. In all cases below, the wind is blowing from left to right. 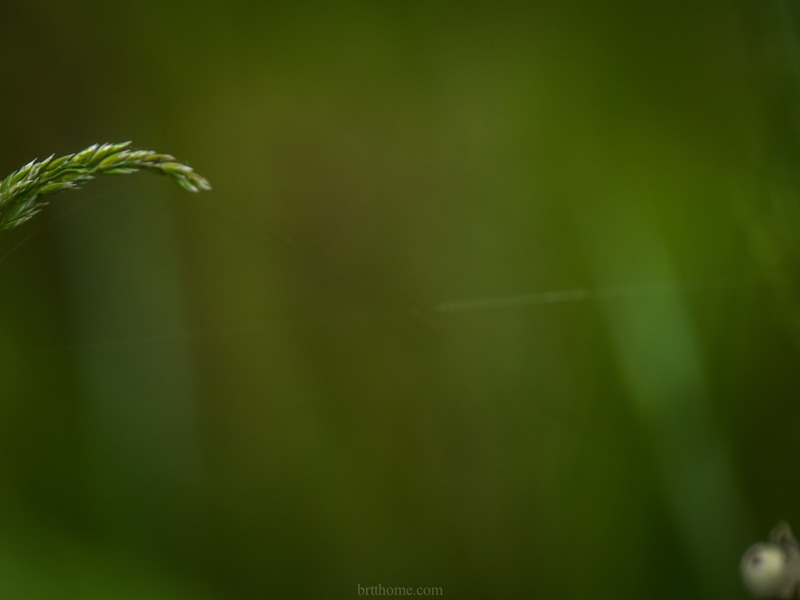 The wind drifts the spun silk downwind towards other blades of grass and seed heads. Usually there are several filaments blowing it the wind at one time. They appear to be at least a metre long. Click on photos to get close-ups. 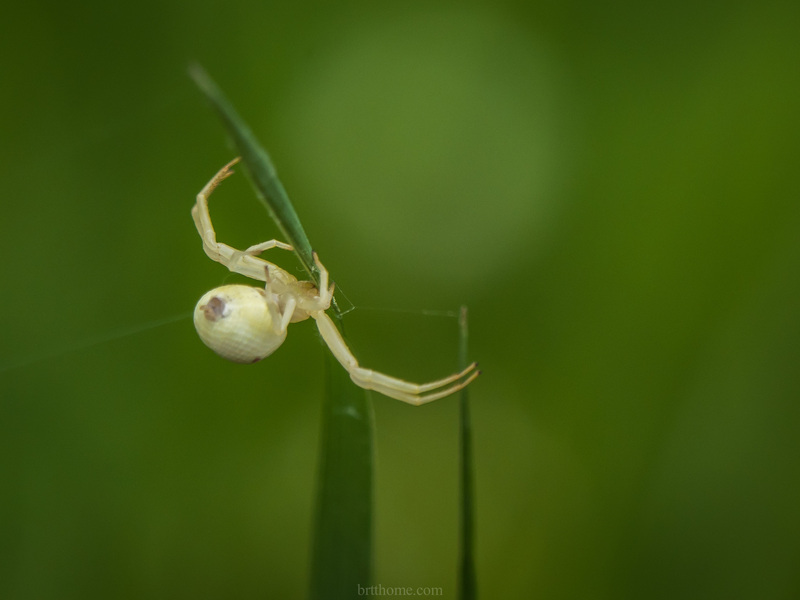 Then, after a filament connects to something downwind, the spider climbs along it to a new position. 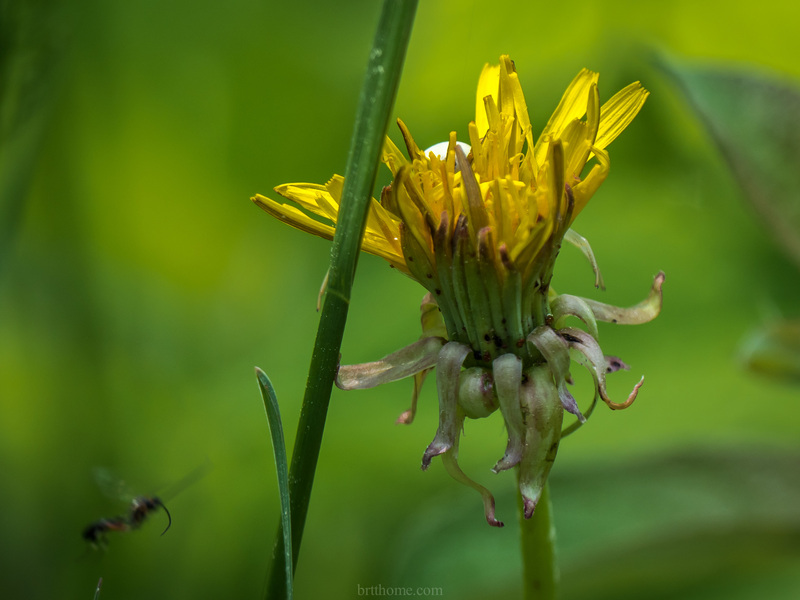 It went down that blade of grass to hide in ambush on the dandelion flower. The approaching Syrphid fly didn’t land on the flower — a wise move!!! 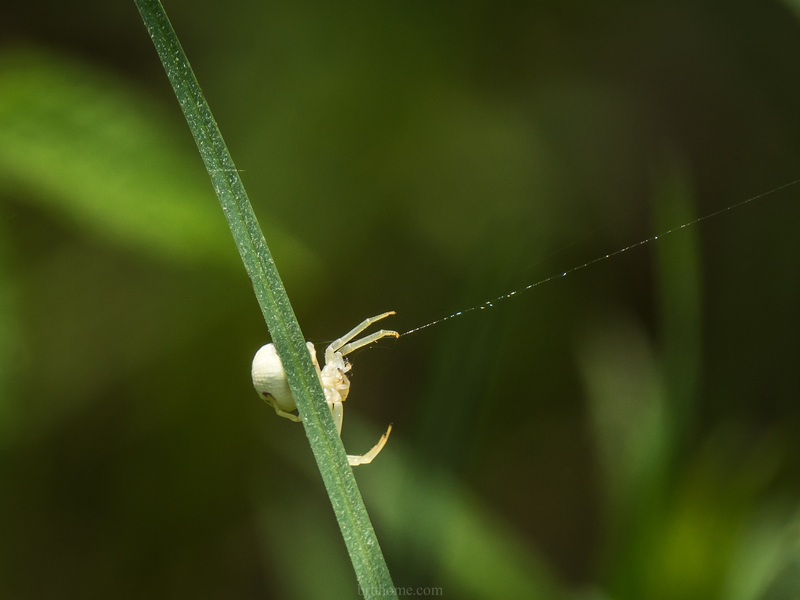 Then the spider went up the stem to the seed head and began to splay our filaments of silk…. 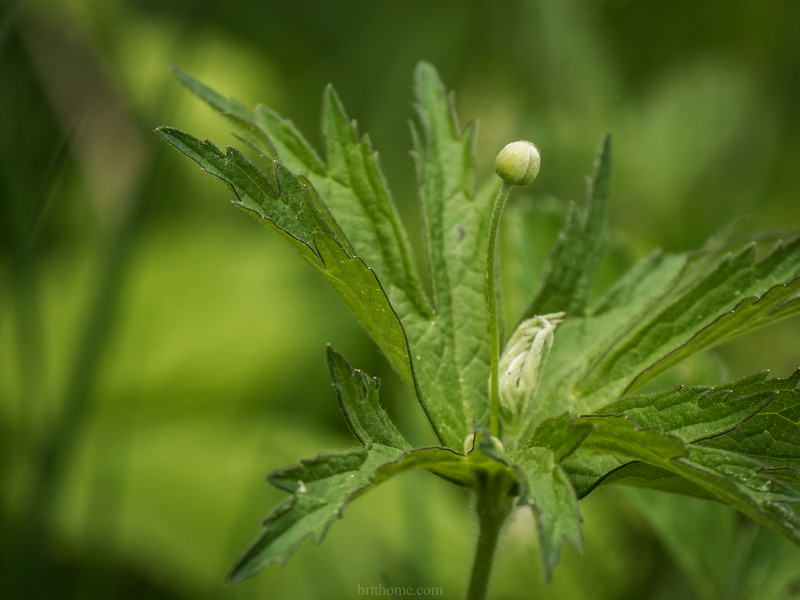 and then it arrived at the next seed head…. 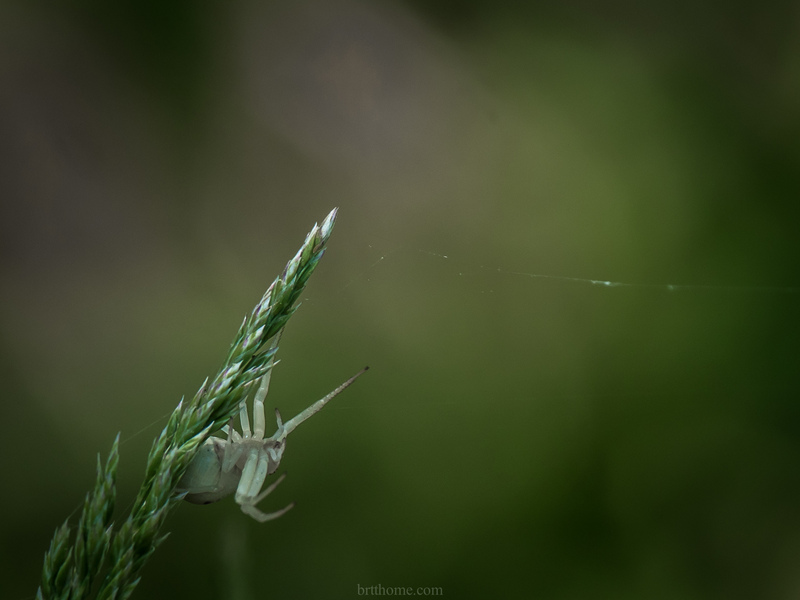 This is the only image that I managed to get of the spider “enroute” to the next seed head. 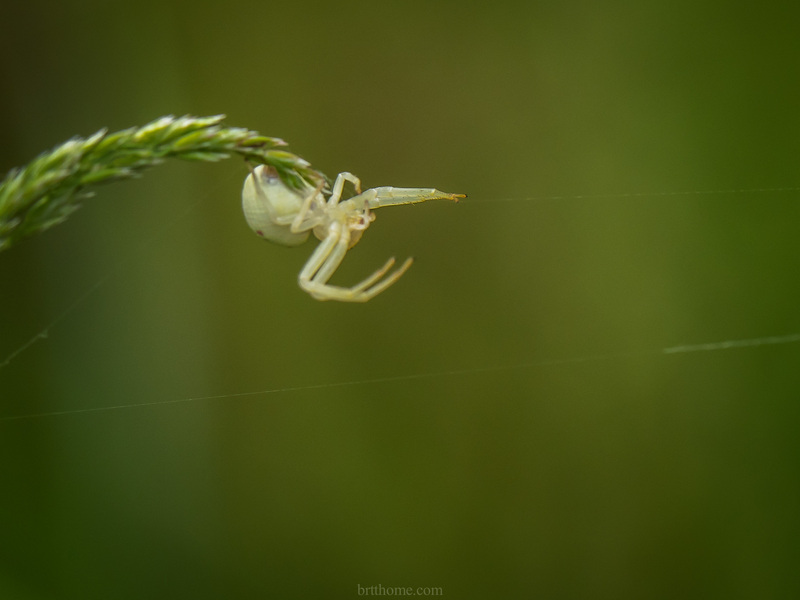 Here it is ready to release some more filaments downwind to tangle in the blades and seedheads of the grasses. 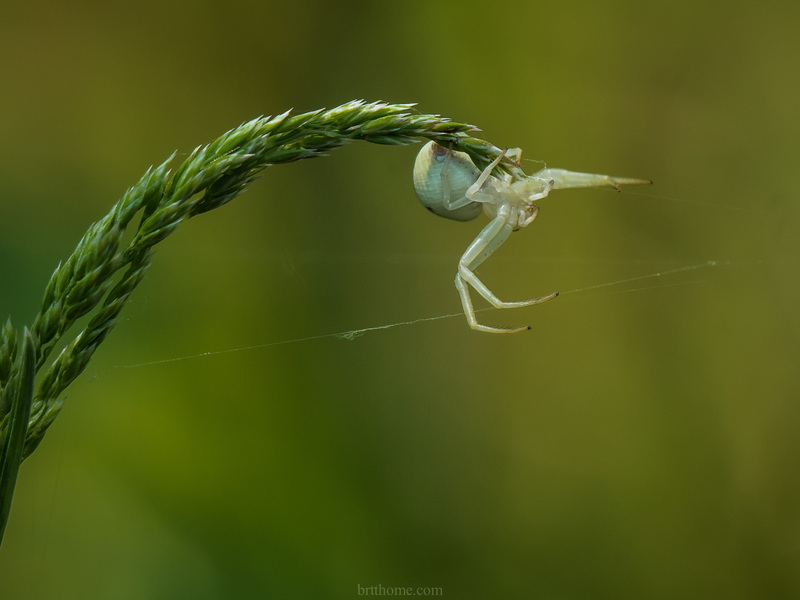 I have to conclude that these spiders only travel downwind this way. This indicates that the architecture of cobwebs is affected by the wind at the time of construction. Lots to learn out there. That is totally amazing, Tom! Yes, it had me entranced for almost an hour! I’d never seen anything like that before. The wonders of nature, eh? A journey of the real Spider-Man. Great shots and wonderfully descriptive travel log. Thanks Tom. Yes, lots of fun. Good use for my time. Better than answering emails!!! Tinsley enjoys the car rides too. Yes, it is events like this that help us to realize how interconnected all of nature is. 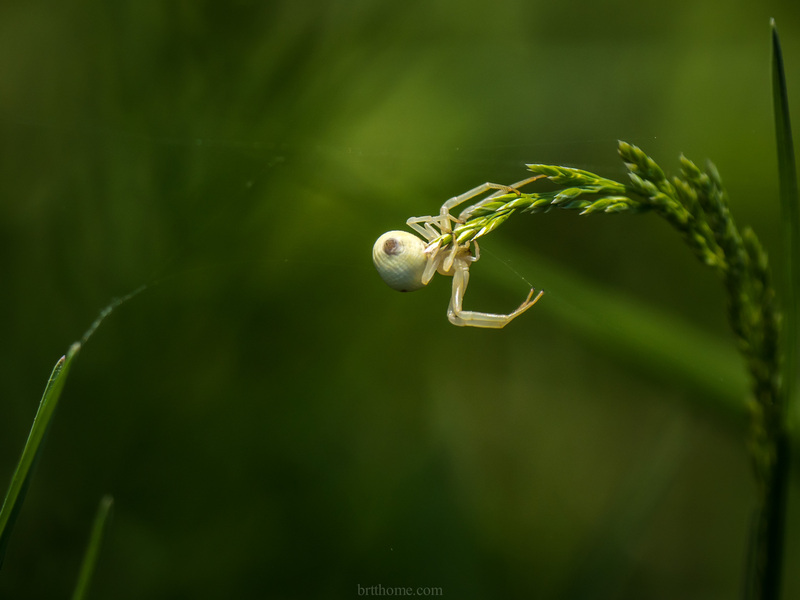 I was very lucky to be in the right spot at the right time — and to notice the spider! It was a very interesting 45 minutes. 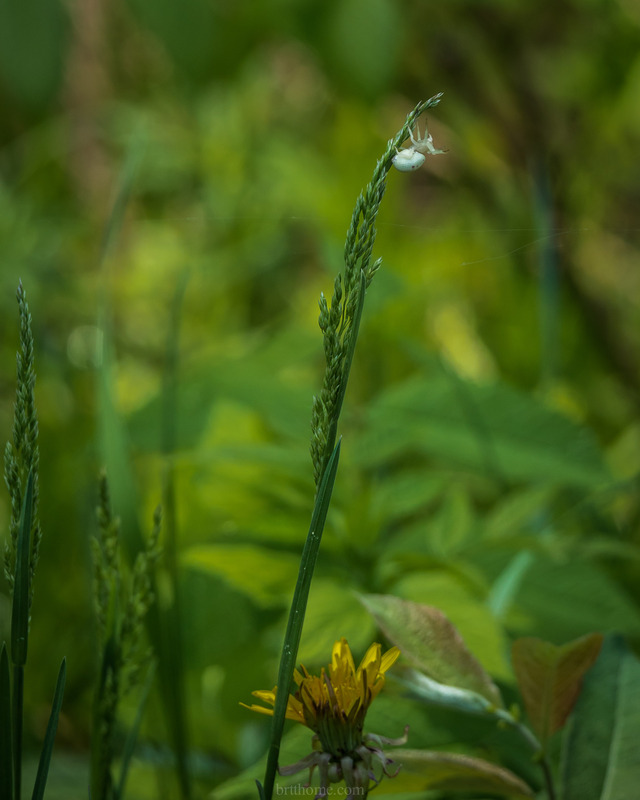 I went back a week later and saw a crab spider in an ox-eye daisy at the same spot on the Old Still River Road. I think it was the same one.